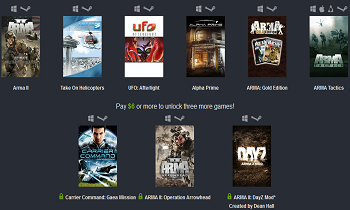 Arma 2 and DayZ are both featured in Humble Bundle's Bohemia Interactive sale. Humble Bundle has just unveiled a new weekly sale focusing in on the various works of Bohemia Interactive. As usual, gamers interested in picking up the contents of this week's bundle will have the choice between paying whatever they want ($1 minimum) for a lesser collection of games, or paying a higher premium price to acquire a larger, arguably more valuable package. Customers who go for the baseline deal will gain access to Arma: Gold Edition, Arma 2, Arma Tactics, Take On Helicopters, UFO: Afterlight, and Alpha Prime. Gamers who opt to pay extra meanwhile ($6 or more) will also be given Carrier Command: Gaea Mission, Arma 2: Operation Arrowhead and DayZ. It's worth noting that the version of DayZ being featured is the original free mod rather than the standalone version recently released in alpha form to Steam. While the mod itself is free however, you will need to the Operation Arrowhead content to play it. In other words, if you were planning on giving the DayZ mod a try, this is a good opportunity to get into it on the cheap. Of course, if you'd rather not cough up $6 the baseline package still contains a lot of decent content that would more than keep you busy. Update: The article originally insinuated that you could play the mod version of DayZ without the Arma 2: Operation Arrowhead content. This was incorrect and we apologize for any confusion that may have occurred as a result.